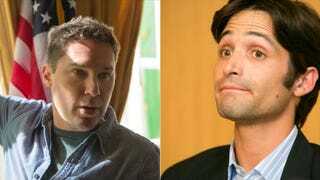 Michael Egan's lawsuit against X-Men director Bryan Singer was dismissed on Wednesday, because the plaintiff said he cannot find a lawyer willing to take the case for him. Egan's previous lawyer, Jeff Herman, quit in July after he declined to take a settlement in the case. According to the Associated Press, Singer tried to have the case dismissed with prejudice to prevent Egan from filing again in the future. (U.S. District Judge Susan Oki Mollway denied that request and dismissed the case without prejudice.) Egan, who claims Singer sexually abused him when he was 17, has dropped three other cases against high-profile entertainment figures including Garth Ancier, David Neuman, and Gary Goddard as well. According to filings, Egan said the move "has little to do with the strength of (Singer's) defense, but rather, it is a consequence of the current circumstances regarding my case, my lack of legal counsel, and my inability to proceed in this matter acting on my own behalf."